--campaign song from the election of 1800. In America's first two presidential elections, George Washington was the unanimous choice, both by popular vote and by the new, cumbersome Electoral College system. But come 1796, when Washington politely but firmly stepped aside, the election wasn't quite so easy. Thirteen men received electoral votes, including two for Washington. The winner was John Adams with 71. Thomas Jefferson came in a mere 3 votes behind Adams, with 68. At the time, the runner-up became Vice President, so Jefferson served in that office. 1. The Naturalization Act. Aliens had been required to live in the United States 5 years before they could become citizens. This act extended the period to 14 years. 2. The Alien Friends Act gave the president the power to deport any alien considered "dangerous to the peace and safety of the United States." Vice President Jefferson and his followers argued that the acts violated the Constitution. In November 1798, a group in Dedham, Massachusetts set up a liberty pole with the words, "No Stamp Act, No Sedition Act, No Alien Bills, No Land Tax, downfall to the Tyrants of America; peace and retirement to the President; Long Live the Vice President." The group's leader, David Brown was arrested and tried in 1799. When the judge wanted Brown to name everyone who'd helped him or subscribed to his writings, Brown refused. He was sentenced to 18 months in prison (and prisons were pretty horrendous back then). It's herds of harpies are no more. A nobler and a happier home." The 1800 election was one of the hardest fought in American history. The results? Because Jefferson and Burr were tied for the lead, the House decided the election, giving Jefferson the presidency and Burr the vice-presidency. Please vote on November 2nd. Colonial Revelers will be performing at Phoenixville's First Friday cultural event. We'll be the ones dressed like refugees from Valley Forge, 1777. We'll also be the ones singing the best drinking songs of the evening. For more information and a map of the street, go to their website. Proceeds benefit Greenbank Mill's Operations Fund. Colonial Revelers will provide tavern music for this night of 18th century food, drink, dancing and games. Participation will be encouraged in all the amusements of the evening. For information on the menu and planned activities, download the Tavern Night event brochure. The current gristmill at Greenbank was built in the 1760s as a merchant mill, to export flour. In 1777, when Washington arrayed his troops across Delaware in an effort to stop the British from invading Philadelphia, it's said that the general posted a guard at Greenbank to protect the provisions. Improvements to the mill in the 19th century kept production flourishing until the 1960s, when an arson fire devastated the business. 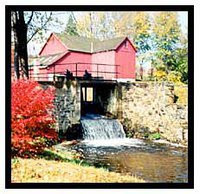 The non-profit Greenbank Mill Associates formed and began restoration in 1987. The site is now open to the public as a living history museum. For more information about Greenbank Mill and its history, click here or call 302-999-9001. Colonial Revelers will sing and stroll the grounds for this all-day event. Living history regiments will present firing and medical demonstrations, 18th century sutlers will sell all sorts of goods and baked items, plus you can tour the historic buildings and museum. Chadds Ford Rotary will provide food and refreshments. On September 11, 1777 at Brandywine, Washington's troops met the British and Hessians under General Howe for the largest battle of the Revolution. For more information about the battle and the park, go to the Friends of Brandywine Battlefield website, call 610-459-3342 x3001, or check them out on Facebook. as any of the most famous. For this year's celebration of our Independence, we offered a short biography of Mr. William Billings. We told of his talent at musical composition, his prolific body of work, and his ability to eke a living from his craft, despite being self-taught and physically impaired. Yet in addition, Mr. Billings ought be remembered for siring the American patriotic hymn. To Thee the tuneful Anthem Soars. We here have sought our calm Retreat. Mr. Billings chose an old melody, popular since the 1640s when the Puritans were warring with the Anglican church. He wrote a new version of the tune, to fit Dr. Byles lyrics, and set the song for four-part harmony. The result was a blend of patriotic sentiment and sacred praise. America was published in October of 1770, the first full hymn in Billings's The New-England Psalm-Singer. Or swiftly driven from our shores. The song quickly grew in popularity, rivaling only Yankee Doodle among the troops. Chester has been called America's first national anthem. With these first patriotic hymns, Billings began a tradition that came to include The Battle Hymn of the Republic, America The Beautiful, and God Bless America. Chester can be heard on Colonial Revelers' CD Revelry, Reflection & Revolution. To hear a sample, watch the video.